I've recently discovered The Plaid Barn, a daily deals site for craft items. 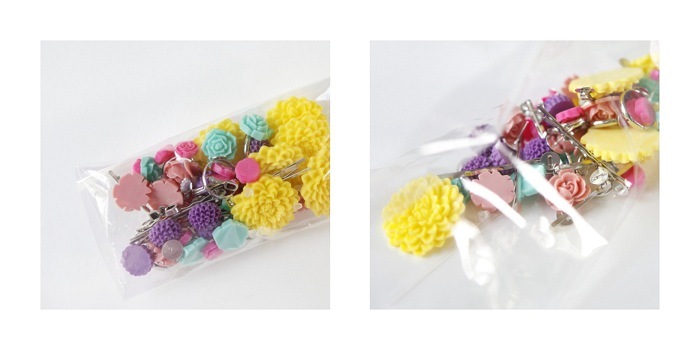 The package above is 'A POP OF COLOR' . I ordered six sets, and they came all together in this wrapper. PACKAGING: Simple, just an envelope with the supplies. Oddly, no invoice or anything about The Plaid Barn. SHIPPING: The fine print said it would ship on or before April 19th, I got it on the 26th. A little longer than what I'm used to with US shipping, but that's okay. QUALITY: I'm not a cabochon expert, but the quality doesn't seem like anything to complain about. Same goes for the finding quality. As you an see in the picture before, one of the cabs isn't perfect. Earring backs were included, which was unexpected and appreciated. Apply some glue to your earring back. Carefully place a jump ring on top, so only half of it will be glued. 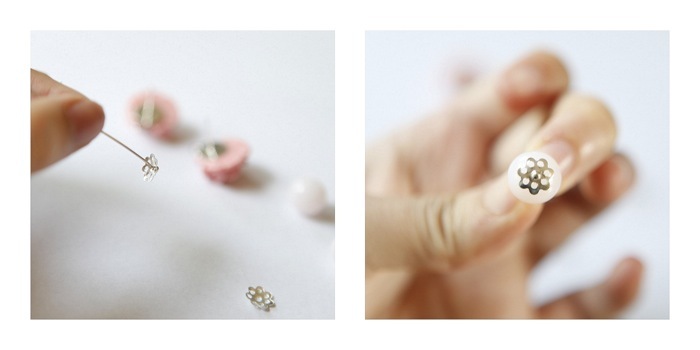 Press on your flower cabochon. Leave the studs to the side to dry. 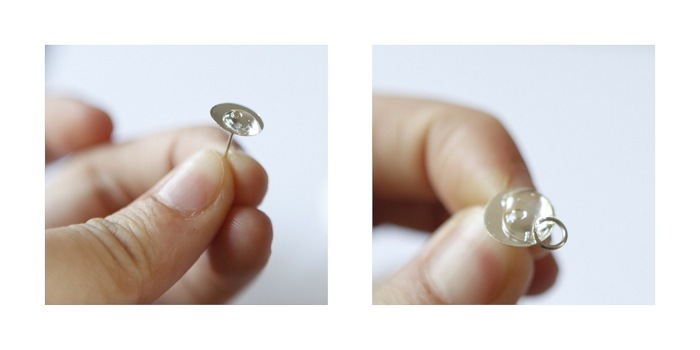 Slide on your bead cap and then your round bead unto your head pin. Make your loops: bend the headpin and then snip off the excess. After your glue has dried, slip on the round bead unto the visible part of your jump ring. Finish your loop. Tada you are finished! 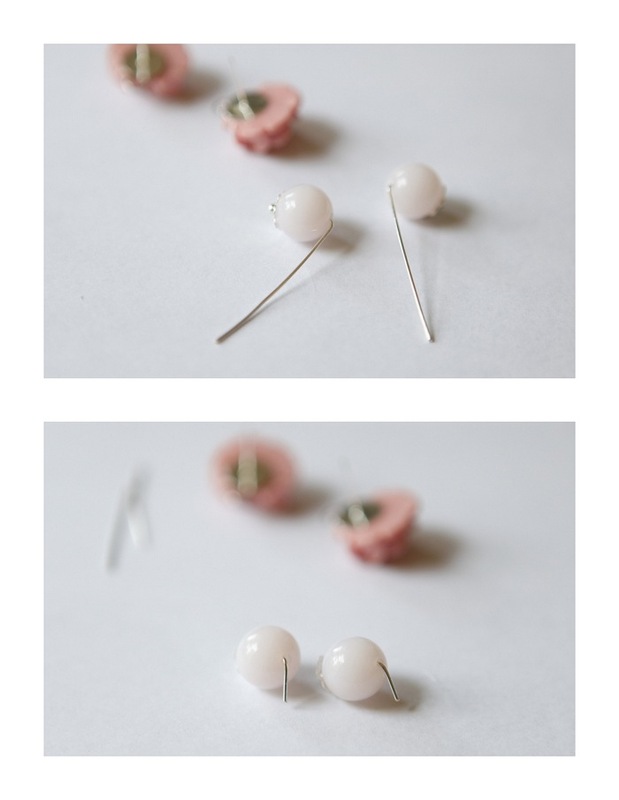 You can also change it up, use different head pins, with or with-out bead cap, etc. Thanks for reading! Has anyone else purchased from The Plaid Barn? I'm waiting on another package from them, hope to get it soon! Love your crafty finds! I'm debating about starting with vintage finds first! I love the plaid barn and have bought from them several times! The only complaint is the shipping is super slow but other than that it's fine. So far I've ordered 4 items from them, shipping is slow, but they addressed that with an email explaining that currently it is a one woman show. They hope to improve shipping times shortly. Quality has been good on everything I've ordered so far. I've made two purchases. One was weeeeeeks ago. I got the e-mail from The Plaid Barn owner about being overwhelmed with orders, so I've got my fingers crossed my first order maybe arrives soon? I remember seeing this pop of color thing, and the stickers I ordered, I think, were featured before that. Jessica: I have a jewelry basics post coming soon! Thanks for inspiring it. Gloria: Thank you so much I appreciate it. Girlrobot: Right? I look forward to all the posts. Im fine with slower shipping as long as I know what I'm getting into. In the fine print it usually says the products will be out on or before a certain date, usually a week after the day. As long as I get my supplies around the date as promised I'm fine. 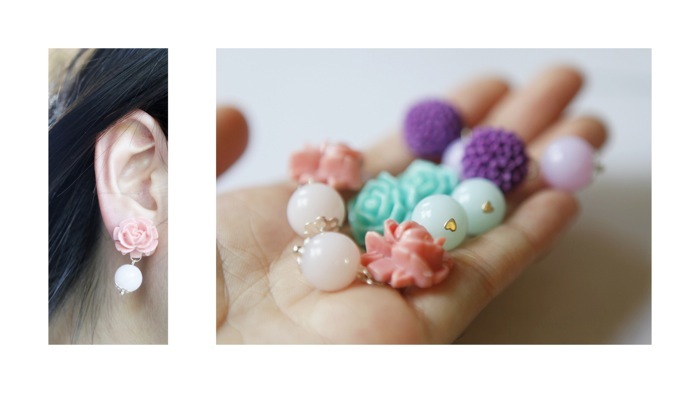 I ordered the chrysanthemum cabs, I hope theyre there when I get home. Jaclyn: The cute heart stickers? I loved those! I hope you get them soon!! I love these! What size jump rings do you use? And where do you buy all of your supplies? 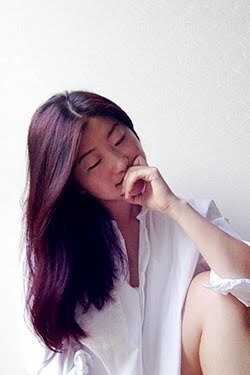 My name is Alyssa and welcome to Hello Whimsy, a DIY fashion blog. For any questions, comments, or business inquiries !